Scary-Crayon and Geek Creek present... G.I. Joe Sigma 6 Valentines!!! I know a dude who was born and raised in Canada -- and despite that crippling cultural handicap, he has proven to be a valuable friend. He sent me a Hulk Hogan DVD a few years back in response to an early draft of this column, and, better still, he recently sent me a box of G.I. Joe Sigma 6 valentines. Once I had smiled at my good fortune in having received such an obscure and unlikely treasure, however, I immediately set it aside and proceeded to ignore it for several months. 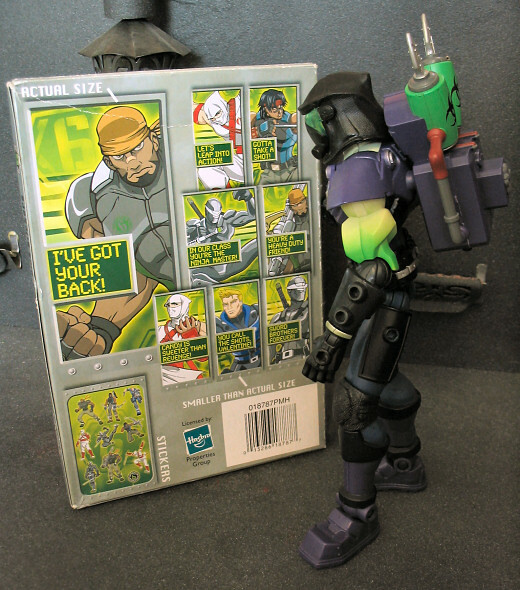 It's no secret that I am a big, graceless, slobbering dork with a mad-on for all things Sigma 6, but while a box of Sigma-themed valentines has plenty of appeal as a novelty item or an ironic curiosity or a feebly vengeful trophy (after all, the G.I. Joe 25th Anniversary series never had any goddamn valentines), what was I supposed to do with the things? 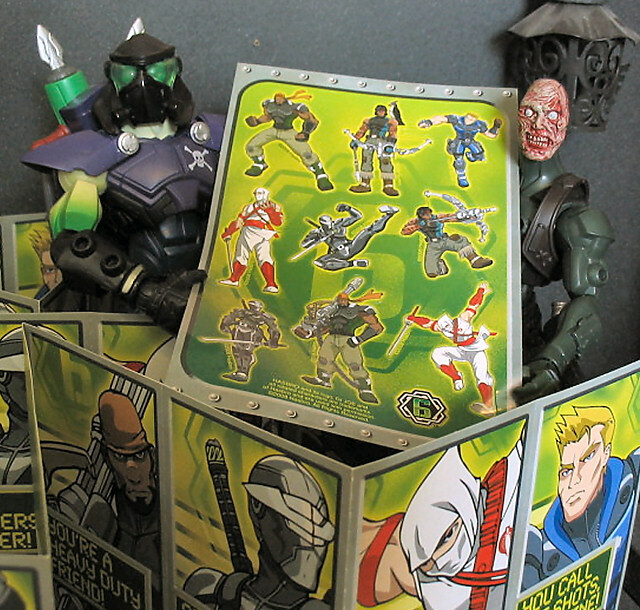 You're looking at a baffling Zartan variant called Toxic Zartan, to whom I added some WWE kneepads, a Snake Eyes mask and a pair of Hi-Tech forearms. I call him Virus. I could have chosen a more iconic figure for this important project, but then I wouldn't be the charismatic rebel you all know and love. Some would suggest that the photo above makes clear that I have no pacing skills as a storyteller, since the back of the box shows every valentine contained inside... thus leaving the reader with no incentive to continue the story. Such people underestimate the allure of Sigma 6 valentines: you can never get enough! 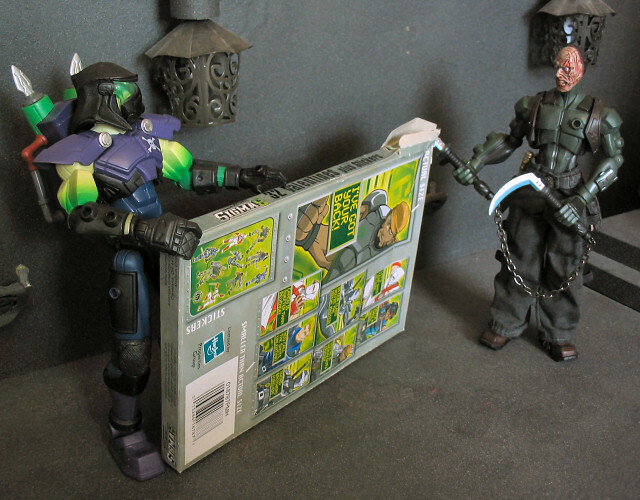 Here Virus has enlisted the help of a fellow half-assed custom, being a Jungle Snake Eyes figure I topped off with a Kroenen head from Mezco's old Hellboy series. I call this'n Hex, on accounta he's kinda sorta based on Tex Hex, from the old Marshall Bravestarr toys and cartoon. Also, note the sacrifices I make for my art -- no doubt I could have put my daughter through college by selling this sealed box on eBay a decade hence. 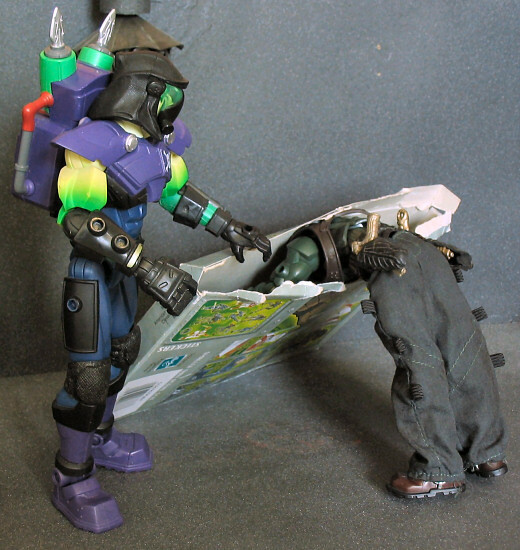 If Sigma 6 was nothing else, it was unanimously celebrated by eager, open-minded G.I. 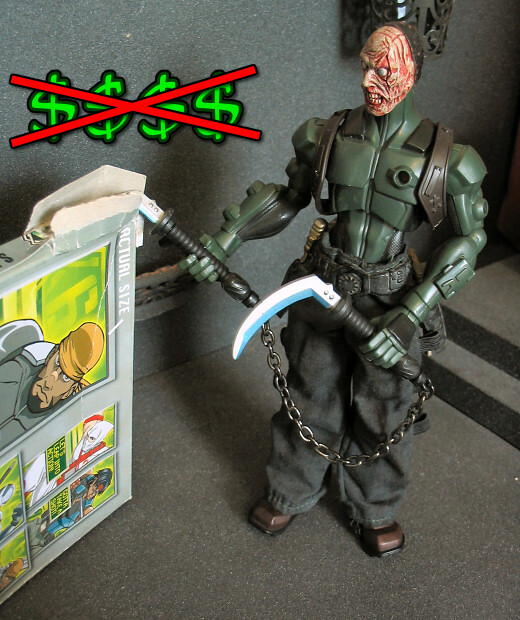 Joe collectors. I am inordinately amused by this photo. 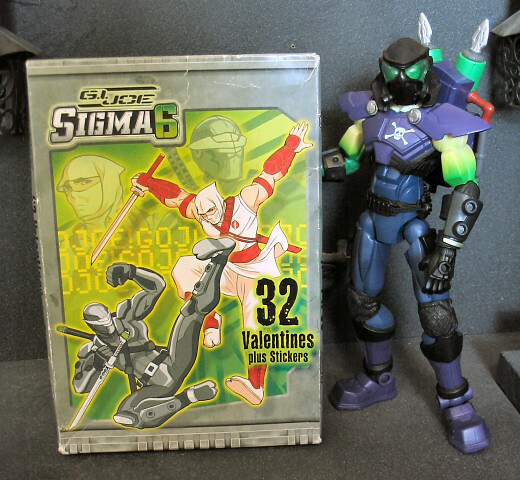 Look closely at the backs of the valentines that Virus is holding -- the Sigma 6 logo is upside-down! 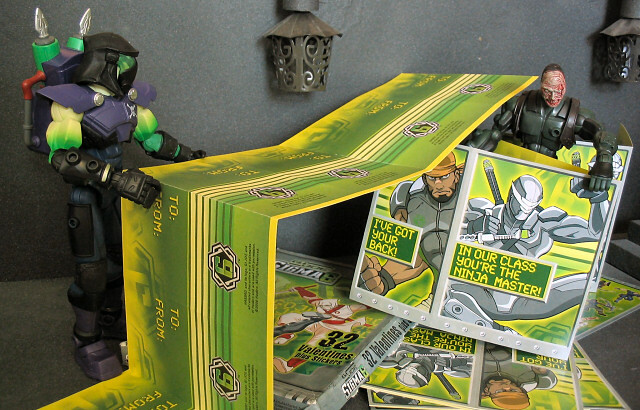 They're supposed to be folded in half, of course, but it's more amusing to think the Joes are so incompetent that they can't even print their logo correctly on simple paper declarations of affection. COBRAAAAAAAAAA!!! 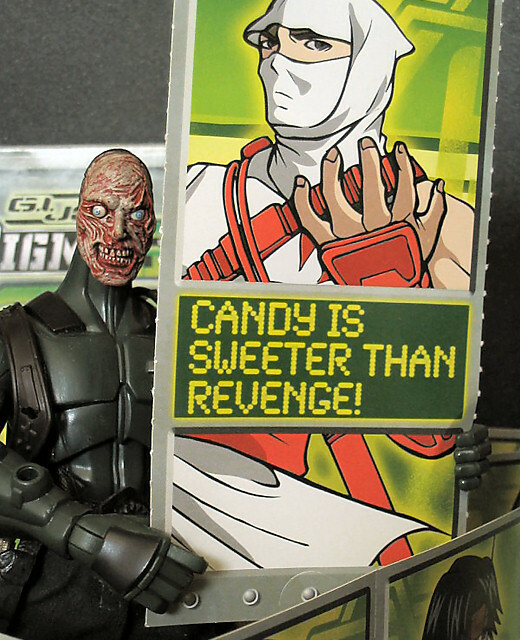 Which is the sadder fact: that Storm Shadow never discovered candy in the Warren Ellis-penned Resolute cartoon, or that "Candy is sweeter than revenge!" is better than any dialogue from the Sigma 6 cartoon? Wow -- what a celebration! 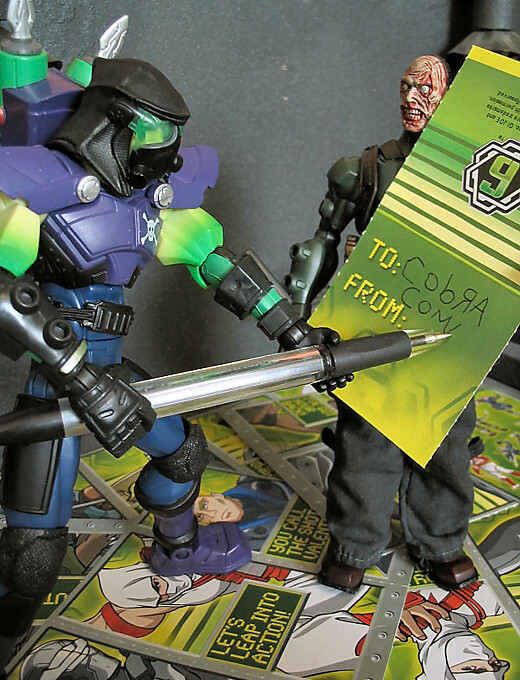 Normally, I'm not one for self-aggrandizing hyperbole, but I'm not afraid to suggest that we have all just witnessed a landmark entry in the valentine-themed toy photography narrative genre. Thank you all for sharing this touchstone with me.